Learn how to paint a starfish with watercolors using black glue as a resist medium. Creating starfish art is a fun art project for kids and teens. 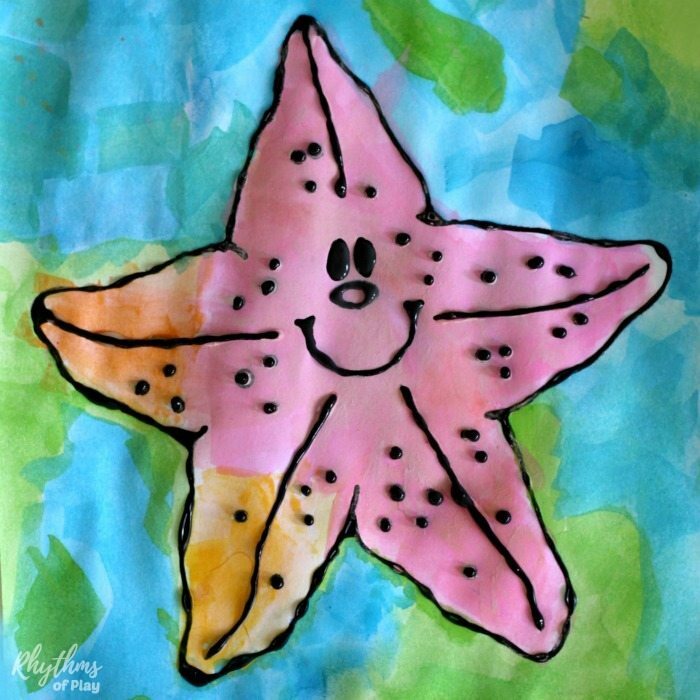 Paint a starfish with the kids for a fun weekend project or homeschool art lesson. Draw your own starfish or enjoy painting a starfish using our FREE printable template! Draw your own starfish to create starfish art or enjoy the stress relieving activity of working with watercolors using our free starfish printable template. We have purposely left it blank in the middle so the artist can decide how they would like to finish it. Making a face or completing the starfish are two easy options. Some of these turn out so beautifully that they can be hung on the wall or framed and given to family and friends as a unique handmade gift. To see 12 more under the sea black glue ocean art projects click on the link! 1. Make black glue by adding a good squirt of black acrylic paint to a small bottle of white glue and shake very well. We have a small bottle of glue dedicated to continually mixing white glue and black acrylic paint into to make a never-ending supply of black glue. I never measure and it always turns out fine. 2. 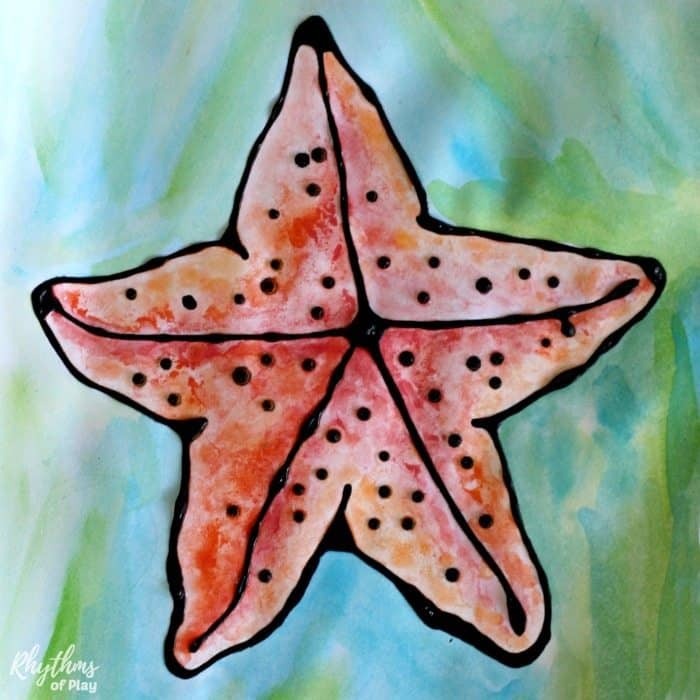 Have your child use a pencil to draw a starfish onto watercolor paper OR print out this FREE starfish printable onto heavy cardstock or watercolor paper like we did. The middle of the starfish has been left blank to allow the artist to decide how it will be finished. I decided to complete the starfish while my daughter made faces on hers. 3. Trace the outline of the starfish with black glue and allow to dry overnight. Older children will be able to do this on their own while younger children will need help. My 4-year-old daughter wanted to do hers “all by herself.” She did a great job! 4. 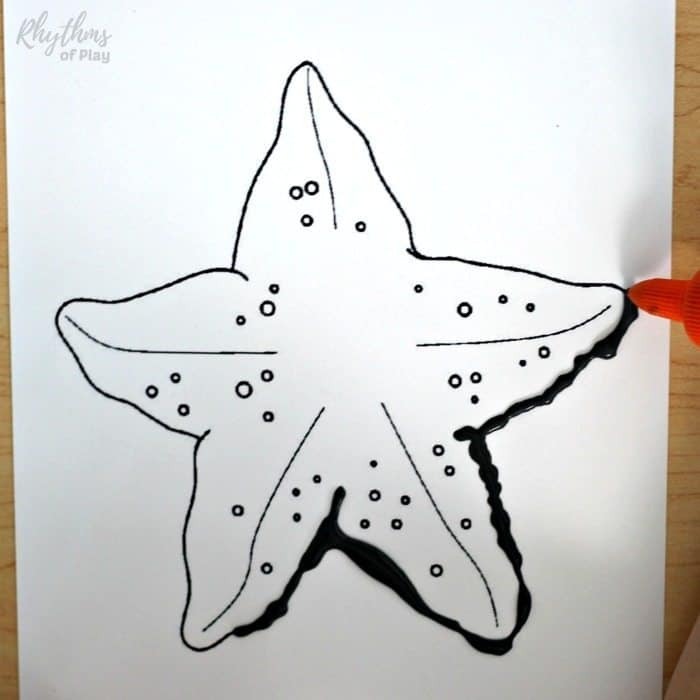 When the black glue is completely dry (overnight is best) invite children to use watercolors to paint their starfish using the colors of their choice. Before painting, place newspaper or paper towels underneath the black glue starfish to help soak up any excess water. Print out and trace as many starfish as you’d like with black glue the night before you plan to paint. Be careful, glue has the tendency to pool and spread when used in large amounts. Use it sparingly to keep nice lines. 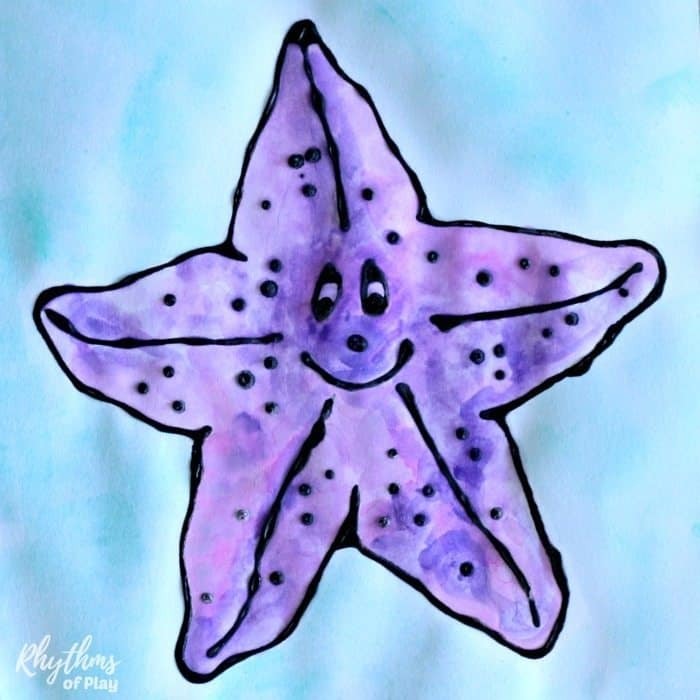 If your child has never worked with watercolors, I recommend preparing at least one extra starfish so you can demonstrate how to paint with watercolors first. Show more than tell, young children learn best by watching others. Watercolor painting is a perfectly imperfect art form. The key to working with watercolors is to literally go with, as opposed to against, the way they naturally flow. Use water to help them flow mix and blend even more. The black glue will resist the watercolor paint but will begin to pull black into the painting if it gets too wet. Have a look at our black glue rose for more tips! 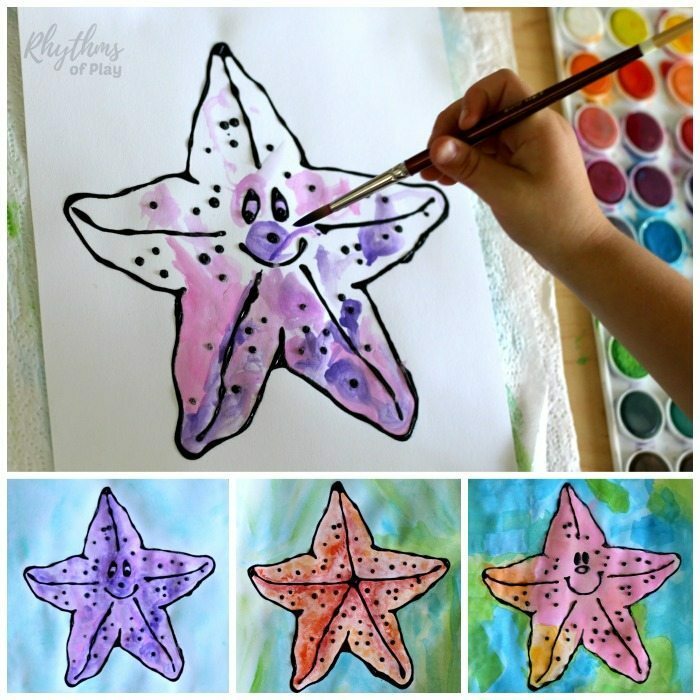 Outlining a starfish with black glue and painting it with watercolors is a fun and easy art project for kids and adults. Try it today! For more information about watercolor painting check out single color, two color, and three color wet-on-wet watercolor painting. You may also like this amazing collection of under the sea ocean art projects that also use black glue as a resist medium. Click on the link to see all of the beautiful ocean art watercolor projects. If you like working with black glue you may like some of the other art projects below. Click on the title to see the full tutorial for each art project. For more fun art and craft ideas for kids and teens click on the link. Learn more about Rhythms of Play HERE! Easy Flower Art Projects Kids LOVE! I love how all of the starfish turned out. Even though the outlines are the same, they are so unique.